Add CAGE code as a new data element on the FPDS-NG contract screen. The CAGE code will be added as a new data element to the FPDS-NG contract screen. The field will be available in the Contractor Information section, via GUI screens and Web Services. FAR Case 2014-005 “Consolidation of Contract Requirements” Phase 2 requires Consolidated Contract to be Required on to FSS and GWACs. Previously the use case was "Not Applicable." The use case will be changed from "Not Applicable” to “Required” for both FSS and GWACs. The V1.5 Data Dictionary will be updated to reflect this change. Allow “Commercial Item Acquisition Procedures” to be entered on a Part 13 BPA Call. The use case for Part 13 BPA Calls for “Commercial Item Acquisition Procedures”, will be changed from ‘Not Applicable’ to ‘Required’. Update the names for the “Legislative Mandates” data element to comply with the FAR. A new web service shall be established to allow Contracting Officers to Close Contracts via Business Services with a new API. The new Close Out API will allow users to close out contracts through their interfacing systems. The function will also be available from the contract screen via the web portal and GUI services in V1.5. New data elements to be display are as follows: ‘Closed Status’, ‘Closed Date’, and ‘Closed By User’. For exercising this option from the web portal the user will select the Close Out Button. Examples are shown below. If the user selected the ‘Close Out’ button by mistake, the user will be prompted with a screen that will be shown where the user can confirm their decision to close out the open contract. If the user does not want to close the contact, the ‘No’ button will cancel the Close Out action. NOTE: Future use of the blank tags will be decided by the executive governance working group following the V1.5 implementation. In order to give more clarity to the Dollar Values contained it FPDS-NG, the data element “Total Estimated Order Value” was added. Also, the names for “Base and All Options Value” and “Maximum Order Limit” were changed. Established a new data element on IDC, FSS and GWACs to distinguish between “Estimated Value of Orders” and “Total Potential Value of Obligations” on the respective IDVs. Changed the name of the data element “Base and All Options Value” to “Base and All Options Value (Total Contract Value)”. Changed the name of data element “Maximum Order Limit” to “Individual Order / Call Limit”. Four socioeconomic vendor types will be added and displayed on the Business Category section of the FPDS-NG screen. These values and the association validation rules are already in FPDS-NG. The only enhancement is to add them to the screen display. The screen will be changed to display the following four socioeconomic categories. A new data element labeled “Additional Reporting” will be added to the Legislative Mandates section on the FPDS-NG screens. 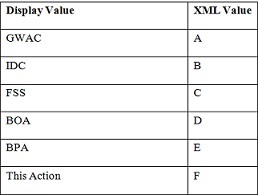 The Data Element labeled “Additional Reporting” will have the following list of values. NOTE: Currently these are the only values in the list. Multiple Values cannot be selected for "Additional Reporting" when 'None of the above' is selected. This enhancement is to assist the user community and the public, to be able to distinguish between what the value is on the IDV from the value on an Award for the data elements “Type of Set Aside Source”, and “IDV Number of Offers”. The new Data Elements “IDV Type of Set Aside”, “Type of Set Aside Source”, “IDV Number of Offers”, “Number of Offers Source”, will be added to all Awards in order to provide clarity as to which values are propagated from the Referenced IDV and which values are selected on the Award. The FY 2017 NAICS Code updates are available and will be added to FPDS-NG effective October 1, 2017. The FY 2017 NAICS Code updates will be included in the deployment of Version 1.5.